Over the next few weeks we'll be working on getting the new list of fleeces for 2019 reservations finalized. Some of the old familiar faces are gone, and some new ones have been added, but there is a good choice of white and colored, fine to long, and with so many fleeces to choose from there is bound to be something for any taste. Remember that fleeces can be split into halves - if one you like looks too big someone else will be happy to pick up a half fleece. Unless otherwise stated, all fleeces have been coated during hay feeding season. However, the sheep were not coated during the summer so some brown tips may be seen on black fleeces. NEW THIS YEAR - because of an expanded festival schedule I will not be as fast as I want to be in getting fleeces fully skirted. We'll offer the option of a light skirting for a lower price per pound. 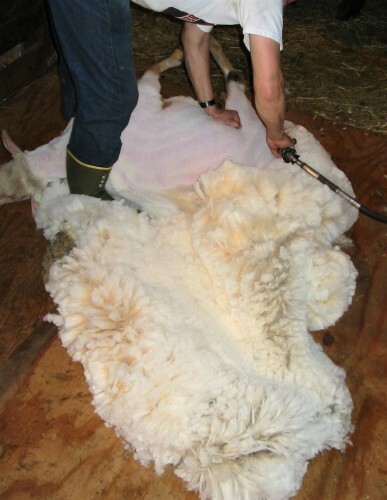 My 'light skirting' means removal of topknot, belly, tail area and any second cuts. Fleece will still include the neck and lower leg wool which may carry some VM. Such fleeces will need further attention before heading to a processing mill but with minimal work you will get more usable wool for a lower price. If you prefer full skirting I will absolutely do it but the wait will be somewhat longer. We will upload the new list to the web page Saturday April 27 at noon (that's EST). If the page title doesn't say "2019 Wool Fleece" keep hitting your Refresh button until it shows up. I've discovered that some servers don't update pages on small websites very often unless you "ask" by hitting the refresh. Email me with your desired reservations, if possible in order of preference. Include a fleece or two that you would like "second dibs" on - I can go to that choice if someone else has already spoken for all your first picks, and sometimes a person has to cancel a reservation later and if I know someone else is wanting it, it makes for more happiness all around. I take fleece requests in the order they arrive at our inbox and post updates to the site as fast as I can. Usually everyone gets one or two of their top choices. Once you tell me who you want, I'll go to the website and put your name there. Then you need to either PayPal me $20 per fleece (you can use this email address: sheepmom@empacc.net ), or send me a check by snail mail. Checks are lovely - no reason to give PayPal more money than necessary even though I like them a lot. :-) You can use PayPal as a guest with a credit card - you don't need to keep an account with them. Don't worry about being scooped electronically by someone else if you are sending a check - once I get an email request from you I'll hold that fleece in your name until payment arrives by whatever method. My mailing address is Robin Nistock, 10137 Mattoon Rd., Prattsburgh, NY 14873 and you can make checks payable to Nistock Farms. This year we did not breed any of the flock. Therefore, there is not quite the same sense of urgency to get the fleeces off the sheep as in past years. Shearing will be scheduled depending on the weather and the shearer's schedule but we're hoping to start in early April. This usually takes 4-5 sessions with the shearer so depending on "things" we should be done shearing sometime late in April. Don't worry - if I've confirmed your name next to a fleece it WILL get to you although I admit I'm not as speedy as I wish I were. IF you have some kind of time constraint, like needing a reserved fleece for a class or something - please do let me know and we'll make sure you get it in time, no matter what. And if you haven't heard from me in a while and wonder about the timetable, just email and ask!